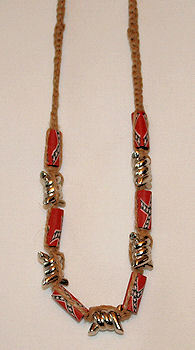 Note: Due to circumstances beyond our control this necklace comes with different types of cords or beads. The heart is always the large one. The current one has blue pucca beads, which is one of the best we have had. I can text you the current model if need be. Just call me. 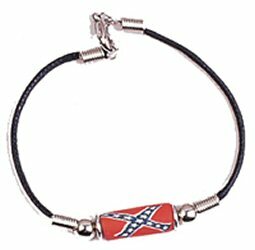 **Due to circumstances beyond our control the bracelet you receive may be slightly different than the one pictured. 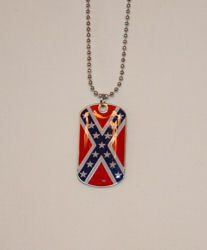 It will have the beads with the Confederate Battle Flag on it and will be equal quality. 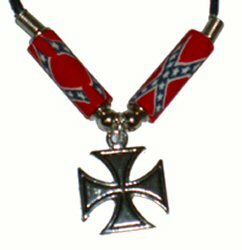 **Due to circumstances beyond our control the necklace you receive may be slightly different than the one pictured, but will have Confederate Battle Flag beads and be of equal quality. 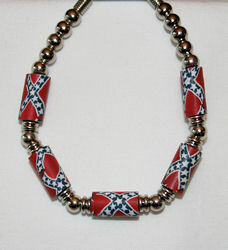 Dixie jewelry is a fun way to show your colors. There is something attention getting about the Southern Cross. Try our bracelet and necklace with the Southern Cross and metal beads, Rebel anklet, Rebel chopper cross and hemp necklace with metal teeth and spikes. 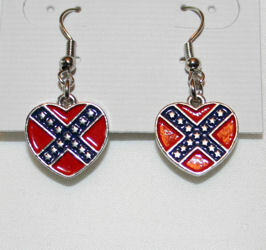 Moms really like the Rebel Heart pendant and earrings. These items are great for birthdays, graduation day, Christmas and Holiday gifts. 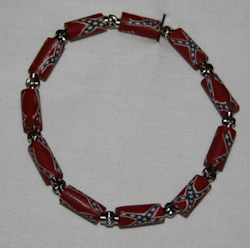 Rebel Yell On-Line also puts this jewelry in some of our Southern Gift Baskets as a special gift basket idea for our Rebel With a Cause, Dixie Darlin' and Redneck Mama gift baskets. We serve all cities and states from Atlanta GA, Boston MA, Dallas Tx, Denver CO, Houston TX, Los Angeles CA, Seattle WA, San Diego CA, New York City to Miami FL, and Alabama, Alaska, Arizona, Arkansas, California, Colorado, Connecticut, DC, Delaware, Florida, Georgia, Hawaii, Illinois, Idaho, Iowa, Indiana, Kansas, Kentucky, Louisiana, Maine, Maryland, Massachusetts, Michigan, Minnesota, Mississippi, Missouri, Montana, Nebraska, Nevada, New Hampshire, New Jersey, New Mexico, New York, North Carolina, North Dakota, Ohio, Oklahoma, Oregon, Pennsylvania, Rhode Island, South Carolina, South Dakota, Texas, Occupied Texas, Tennessee, Utah, Vermont, Virginia, Washington, West Virginia, Wisconsin, Wyoming, and Puerto Rico.